Perhaps like me you often find yourself cooking something brand new whenever you have company for dinner. I don’t know why I do that to myself, after all, you don’t know how it will taste or turn out, but I suppose it’s b/c we’re inspired to try new things. This evening I made this simple, fast, yet tasty meal for me and my guest. 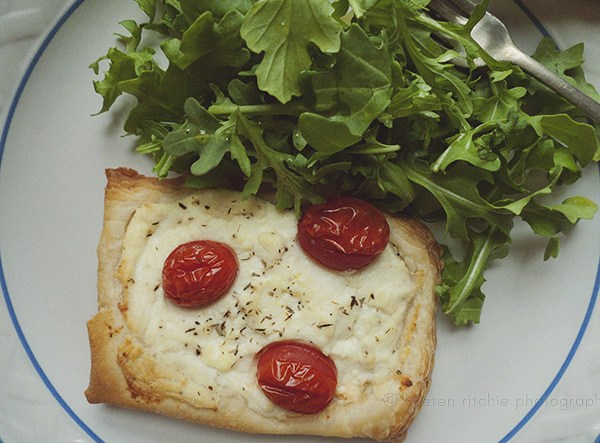 These little wonders are called roasted tomato tarts and I am happy to share the recipe with you below. I served it with arugula. I just love the peppery flavour of arugula. 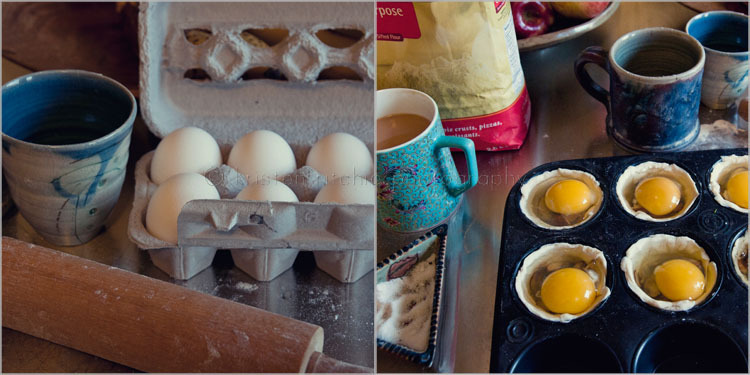 Cut 1 sheet of thawed store-bought puffed pastry into 4 and place on a baking tray lined with parchment paper. Combine 1 cup fresh ricotta with 1/4 cup grated parmesan, sea salt and cracked black pepper. Spread the ricotta over the pastries leaving a border. 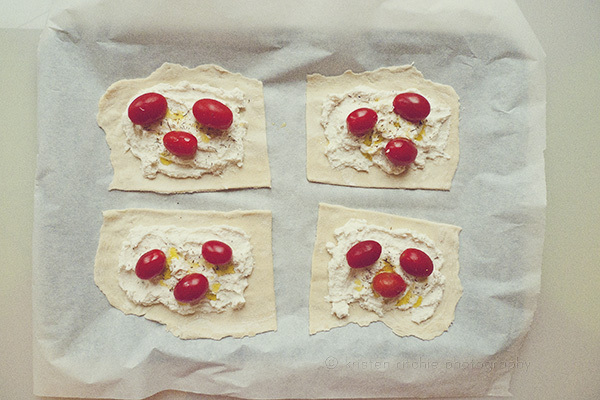 Top each pastry with 3 cherry tomatoes. 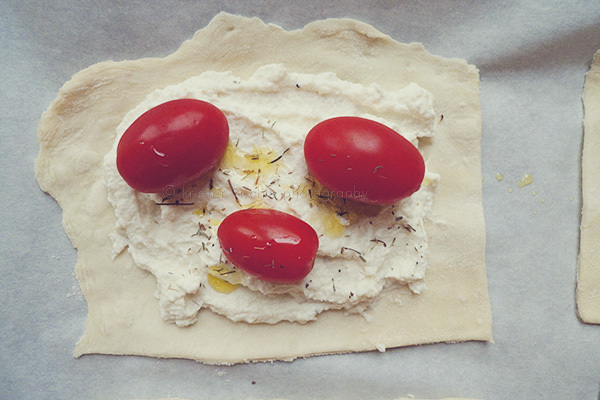 Drizzle with olive oil and sprinkle with thyme leaves. Bake in a preheated 355 degree oven for 35-30 minutes or until pastry is puffed and golden. Makes 4. 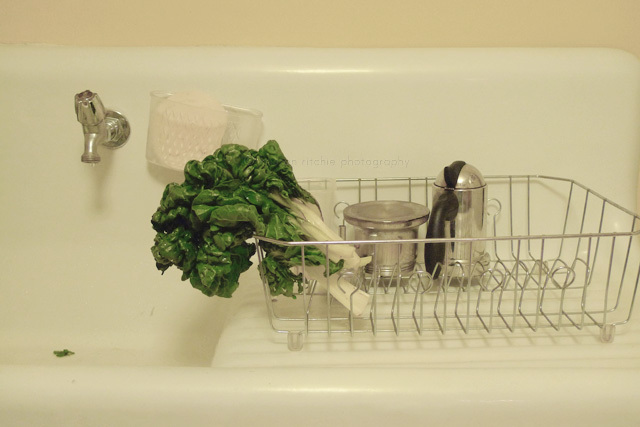 Some lovely local swiss chard, washed and ready to be eaten for my dinner. A simple recipe I enjoy is sauteed butter, garlic, anchovy paste, lemon juice, cannellini beans and swiss chard. Very flavourful and filling. So I’m in the midst of planning out a new web site and blog. I feel the need to create something that better represents who I am/want to become as a photographer. 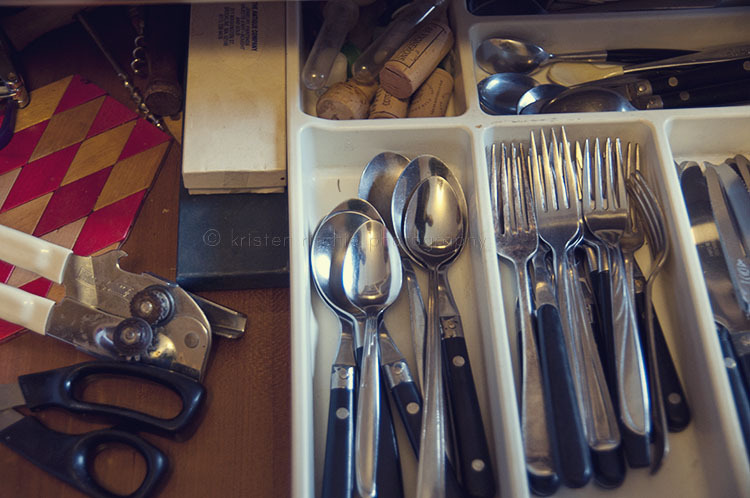 I am also interested in showcasing more of my own personal photography on my new site, and not just solely client work. I’m feeling keen and excited for a new look. I’ll keep you posted. 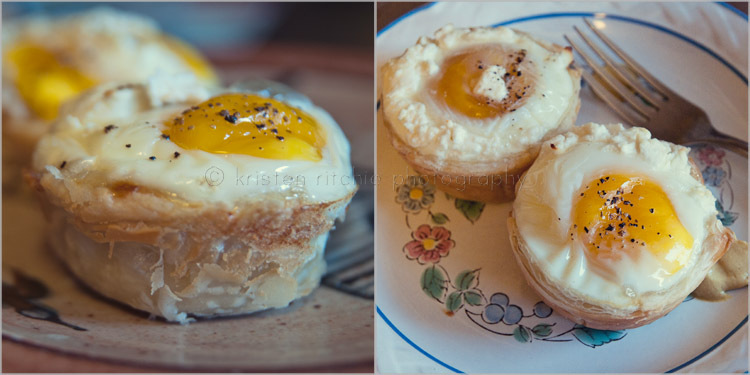 < My friend Siobhan was visiting this past weekend and lucky for me she loves to cook and try new things, hence eggs with mushrooms, rosemary, garlic, salt, pepper and goats cheese all in puff pastry for breakfast. YUM!